HEAD-Hold large crochet hook horizontally on 2 ½ x 5 inch cardboard. Wind 1 skein White “AUNT LYDIA’S” HEAVY RUG YARN over 2 ½ inch part of board. With large crochet hook pull three 22-inch lengths of yarn halfway through opening and tie. Remove cardboard. Trim into ball for head. BODY-Work 2 more pompons in same manner. Sew these 2 pompons together at tying point. Trim into a ball for center of body. Work 3 more pompons in same manner, sew together at tying point. Trim into a ball for lower part of body. 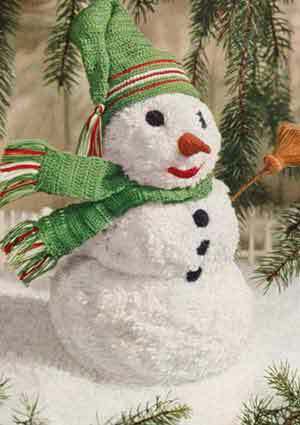 Take the free lengths of yarn of head pompon, draw through the middle of the center body section and lower part of body. Tie all ends together. Insert stick through center of entire snow man. HAT-Is worked with “PURITAN” CROCHET COTTON and “STAR” SIX STRAND EMBROIDERY COTTON. With Green starting at cuff, ch 92, sc in 2nd st from hook, 1 sc in each remaining st of ch, join being careful not to twist work. 2nd Round-l sc in each sc, join, cut thread. 3rd Round-Attach Red and work 1 sc in each sc, join, cut thread. Working in same manner work 2 rounds Green, 1 round White, 1 round Red, 1 round White, 2 rounds Green, 1 round Red and 2 rounds Green. 14th Round-Ch 3, counts as 1 dc, 1 dc in each sc, join and turn this and following rounds. Work 2 more rounds even in dc. 17th Round-Working in dc, decrease in every 9th and 10th st (to decrease: *thread over hook, insert in next st, pull through and work off 2 loops, repeat from * once, thread over and work off all loops at one time). 18th Round-Decrease in every 8th and 9th st.
19th Round-Decrease in every 6th and 7th st. Work 2 rounds even. Repeat the last 3 rounds 7 times. 43rd Round-Decrease 3 sts. Work 1 round even. Repeat the last 2 rounds 3 times. Next 2 Rounds-Same as 41st round, cut thread leaving a length for sewing. Sew opening closed. With wrong side of 1st round toward you, attach Green and work 1 sc in each st, join, cut thread. Fold colored section upward. SCARF-With Green ch 15, dc in 4th st from hook, 1 dc in each remaining st of ch, turn. 2nd Row-Ch 3, 1 dc in each dc, turn. Repeat last row until work measures 16 inches, cut thread. FRINGE-Cut 2-4 inch lengths of thread, fold in half, loop through a st, pull ends through loop and pull tightly. Working in same manner arrange colors as follows-2 Green, 1 Red, 2 Green, 1 White, 1 Red, 1 White, 2 Green, 1 Red and 2 Green. NOSE-With Orange ch 13, sc in 2nd st from hook, 1 sc in each remaining st of ch, ch 1 to turn all rows. 2nd Row-Working in sc, work 2 sc in each sc. Work 1 row even. 4th Row-Decrease in every 2nd and 3rd st across row. Work 1 row even. Repeat the last 2 rows 4 times. 14th Row-Decrease 2 sts, cut thread leaving a length. Sew long edges together. Fill with kapok. EYES AND BUTTONS-With Black ch 2, 8 sc in 2nd st from hook, do not join. 2nd Round-2 sc in each sc, join, cut thread. Work 4 more circles in same manner. MOUTH-With Red ch 15, sc in 2nd st from hook, sc in next st, 1 sdc in each of the next 2 sts (sdc: thread over hook, insert in st, pull loop through, thread over and work off all loops at one time), 1 dc in each of the next 2 sts 1 trc in each of the next 2 sts, 1 dc in each of the next 2 sts, 1 sdc in each of the next 2 sts, 1 sc in each remaining st, cut thread. Sew eyes, nose, mouth and buttons in position as illustrated. BROOM-Wind Golden Brown tightly over a pipe cleaner, fasten ends with tape or glue, bend one end about ½ inch. Over a 1 ½ inch cardboard wind Golden Brown 90 times, slip length of thread through one end and fasten to bent end of pipe cleaner, twist end of pipe cleaner tightly to hold broom in place. Tie broom about ⅜ inch from 1st tying. Insert through body as illustrated.